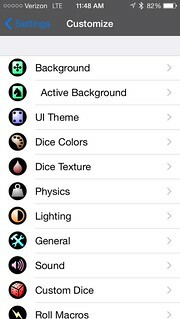 This is a quick review of some dice rolling apps on iOS, specifically ones that let you make custom dice. 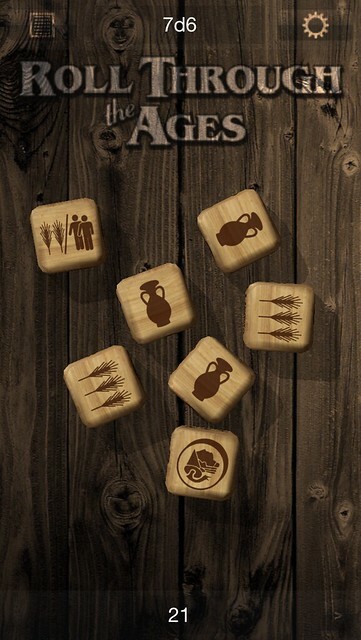 For this example, I’m recreating dice from Roll Through the Ages, an excellent dice game from Gryphon Games. It’s a six-sided die (d6) with images on each side. 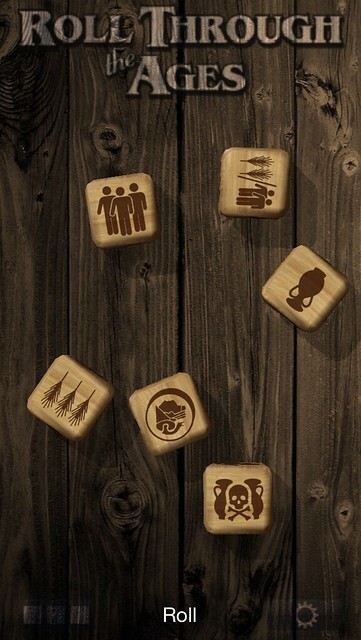 In each app I will use the same 6 images and background to recreate these dice. 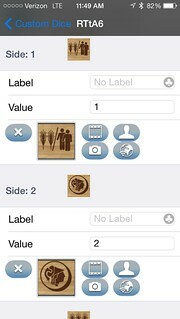 The exact opposite of Dicenomicon is Photo Dice – almost no features, but what it does is very easy to use. Creating a new die (only d6, as opposed to Dicenomicon which can do any number of sides) is a couple taps, and assigning an image to each side is super fast and easy (and no crashes!). Dice rolling is similar to Dicenomicon, but holding dice and moving them around only requires a single tap, so it’s quicker. The next step up from Photo Dice is Mach Dice, by the same developer. It takes the ease of use of Photo Dice and adds the ability to create more than just d6 dice. It also has 5 playfields, so you can set each playfield with a different background image and dice configuration and switch between them. Mach Dice does have more of a learning curve than Photo Dice, but nowhere near that of Dicenomicon. You create a custom die with a number of square images, then when you add a new die to a playfield, you specify the image set to use for it. The only difficulty here is that all image sets are square images, if you use those images to create anything other than a d6, the images will be mapped on the die face and masked to that shape, so for example a d8 will use a triangular section of the square image you have set. Knowing exactly where the image will be cropped for any given die requires a lot of trial and error, this could have been made much easier by providing a template for each die face. 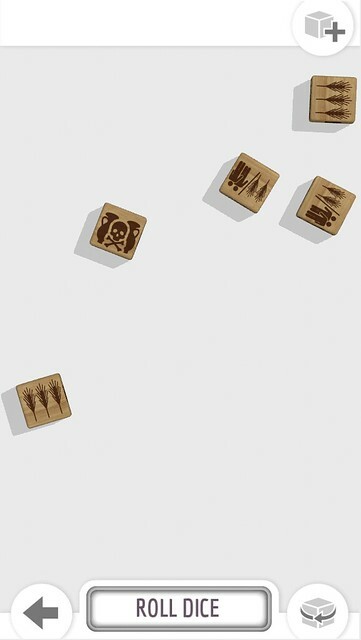 The die rolling area is similar to Dicenomicon – unlike Photo Dice, there is some space taken up by a header bar, so plan image placement accordingly for backgrounds. Dice rolling itself is great, with the same system for holding and moving as Photo Dice. 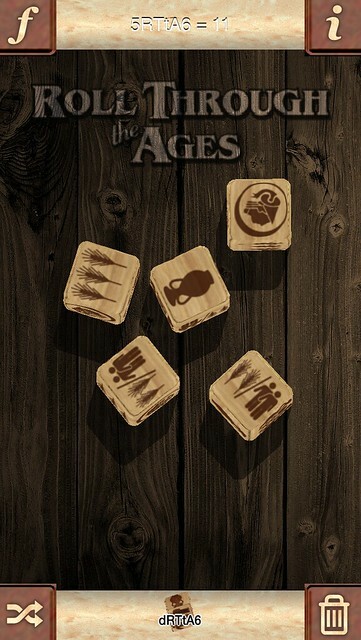 Similar complexity to Mach Dice is Dice Forge. 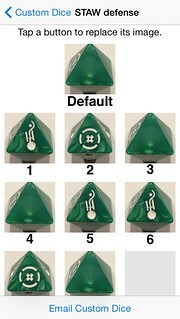 However, creating custom dice is a multi-step affair that you can’t actually do in the program itself. It will export templates (simple unfolded texture maps) that you then have to edit it Photoshop or your editor of choice, then re-import into Dice Forge. It’s not something you can easily do on the go, so you’re going to need your computer to make new dice. 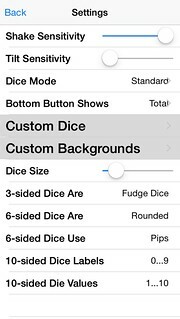 Once you import the texture, you add dice to your dice pool – which is an extra step compared to Dicenomicon or Photo Dice, where you just tap a die to add it directly to the table. 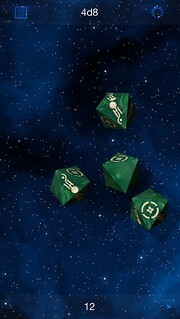 The die rolling is lackluster, small dice fly across the screen when you click “roll dice” – rather than using the gyro to allow you to shake the dice like Dicenomicon or Photo Dice, Dice Forge uses a “shake” to simply re-trigger the throw animation, which has nothing to do with how you shake the phone. It makes the dice feel less physical. 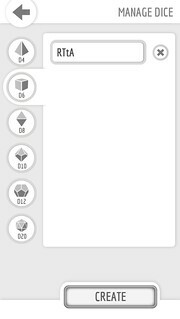 When you hold dice, instead of anchoring them on the table when you reroll, like the other apps, Dice Forge moves them offscreen to a “held” dice pool, so it’s extra steps if you want to view all the dice after rerolling some. There is also a “flyby” mode where the camera rotates around the table showing your roll. It’s pretty but serves no purpose. Overall, Dice Forge has the least satisfying rolling experience of the three. There’s also no option to change the background image. 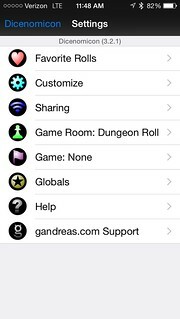 Dicenomicon has all the features you could want, however it has a learning curve and hasn’t been updated in a while and has some annoying bugs. 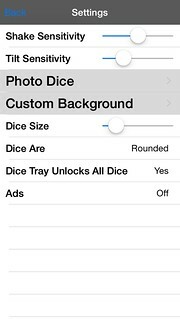 Photo Dice is basic but fun to use and cheap – if all you want are custom 6-sided dice, this is the app you should get. Mach Dice keeps the ease of Photo Dice but adds different die types. 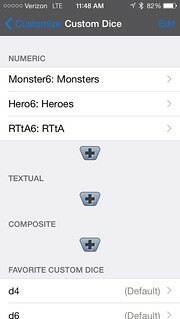 Not as many features as Dicenomicon, but also easier to use. Making dice other than d6 requires a little trial and error to see where the crops will happen, but overall this is my favorite of these dice apps and the one I’d recommend most. Dice Forge has the flexibility to make custom dice of any type, but little else. The dice are tiny and the rolling doesn’t “feel” as good. Overall it feels overpriced at $5. Moses and I entered a Zombies!!! tournament – I won first place, Moses won third. First place – $125 in PAX merchendise. Sweet! Posted on August 30, 2008 Tags games, pax3 Comments on First place! I recently got Eye of Judgement for the Playstation 3. Actually, it’s the only game disc I own for the PS3 – I bought a few small downloadable games, but Eye of Judgement is the first “real” game I bought. On Amazon, it’s $45 for the game, which comes bundled with the Playstation Eye (PSeye). $45 for a game and a webcam is pretty cheap. I think if you buy the webcam by itself, it’s $30. It comes with the game, PSeye, game mat, stand for the PSeye, starter deck, and one booster pack. Probably the reason the whole thing is so cheap is they expect to make it up in booster pack sales. As with Magic: the Gathering, it’s all about getting a bunch of good cards, and building a deck from them that works well. Booster packs are pretty pricey, $4 for 8 cards. You assemble the stand, attach the PSeye to the stand, plug the PSeye into the PS3, and lay the game mat under the PSeye. You want a well-lit area, since the primary premise here is that the PSeye can see which cards are being played, and have the game react accordingly. This setup is easy enough in my bedroom, but if I ever want to set it up in my living room, I’ll have to hook up some kind of powered USB extension to reach across the room to the coffee table. The cards have two main features, as far as the PSeye is concerned: oversized black bars at the top and bottom of the card, and green triangles on the sides of the card. The black bars act as an oversized barcode to let the PS3 determine which card it is, and the green triangles allow the PS3 to know the orientation of the card. There is a test mode, where you can hold a card and view it as a rendered pop-up. It shows the video feed from the PSeye, with a 3D model of the monster from that card overlayed on the video feed, scaled and rotated so it appears to be standing on the card. 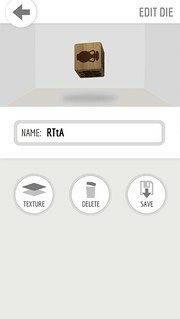 You can move and rotate the card and the 3D model updates reasonably quickly. You can tilt the card slightly from side to side, but since the marks on the card have to be clearly in camera, you can’t tilt it that far. This test mode is the most traditional use of augmented reality, but in actual gameplay the entire video feed is covered, so isn’t such direct AR. The game is played on the 3×3 grid of the game mat. 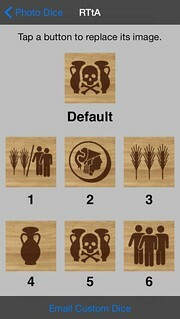 The object is to have a creature card in 5 of the 9 squares at the end of your turn (thus controlling a majority of the board). Since there are only 9 potential places to play, the game play is much shorter and more strategic than a game of Magic, which could easily last over an hour. Typical Eye of Judgement games last about 20 minutes, though that’s just an estimate, I didn’t actually time them. I won’t go into all the details of gameplay, but it’s very strategic. 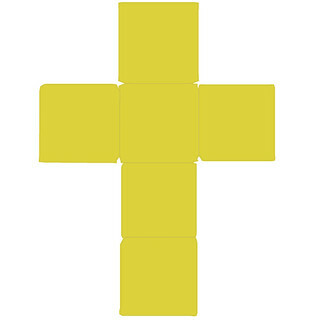 Each square has a type, and each card has a type, so where you play the card is very important. Creatures also have strong sides and weak sides, so the direction the card is facing when you play it is important as well. I just noticed the price on Amazon has gone from $45 to $65… not as great a deal, but still not too bad for a game and a webcam. I was at Best Buy today, and noticed by the checkout they had Halo 3 collector’s editions on clearance. Guess they couldn’t get rid of them at $130 a pop, so to clear shelf space, they had them marked down to $50. The regular edition is still $60, so I figured, what the hell, and picked it up. Cheaper than the regular one, and I get the shiny mini-helmet. Gary Gygax just died. I never knew him, never met him, but he was one of the primary architects of my childhood. He created Dungeons and Dragons, which in its various incarnations served as a hub, a jumping off point for wild imaginings and storytelling in the most classic and ancient meaning of the word. Storytelling not by repeating a tale, but from weaving it, crafting it on the spot with input from any number of active listeners. Not passive listeners, but listeners who can help steer the tale. Listeners who will be mentally and emotionally invested in a tale if it is well-told – they will meet new friends there, look forward to cameos from old favorites, and fight monsters and villains. I always enjoyed D&D, when I was running a game, I cared more about creating interesting characters, memorable moments, fun puzzles, than I did about the actual *rules* of the game. Sure, they were there, but I looked on them as a resource to be tapped when needed, not as the driving force. I can’t count the number of times I played D&D late into the night with friends, only going to sleep when our bodies simply failed to function, then awoke to start right on playing. I remember a time that D&D saved me. It was when I was going to Lotus Land School (later renamed Jordan Glen School) in Archer, Florida. I was probably around 10 years old. There were these two boys, I don’t even remember their names, but they would bully me all the time. On the tennis court they would hit balls at me as hard as they could, trying to peg me. Or they would knock me down, or throw my books. I remember one time, they were chasing me through the school, it must have been after hours, since the classrooms were empty. As I fled, I knocked chairs over behind me, causing them to trip and swear and try to catch me even more. I realized I didn’t have a plan of escape. In one of the rooms, I stopped and turned to them. “Wait,” I said, “have you ever heard of D&D?” They stopped, puzzled, and I told them about it. They didn’t really get it, so I dispensed with all the rules, pared it down to its essentials, an interactive story. But it was then that I realized the real power of intellect, of creativity. From that point on, I never knew anyone I considered an enemy*. Imagination, it turns out, is a pretty powerful thing. So anyway, Gary, who I never knew, thank you for your worlds, and for showing me how to create my own. *ok, there were two people since then that I have called “nemesis”. One I no longer have a problem with, and the other is hopefully long dead. I just finished playing Portal, a fun little puzzle game that’s part of Valve’s Orange Box. The game is clever, you have a gun that fires wormholes – you fire two holes, a start point hole and a destination hole. Then you or other objects can move back and forth between the two points as if they were connected. Then you have to solve puzzles to get to the exit. For example, there might be a big red button on the floor. When you stand on the button, the exit door opens, but when you walk off the button to go to the exit, you step off the button, so the door closes again. Nearby is a crate. So you put one side of the wormhole on the ceiling above the button, and the other side of the wormhole you open under the crate. The crate falls through the hole and emerges from the hole in the ceiling, landing on the button, holding the exit door open so you can walk through. That’s the basic gameplay, which gets tricky when gravity comes into play, since you might fall from a height into a wormhole in the floor and emerge from a wormhole in the wall – since the holes are at 90 degree angles, your downward falling momentum is converted into forward movement. The game itself is smart and fun, but what really makes it a great game is that as you move from room to room, there is a deranged AI talking to you over the intercom. The AI says such funny things in a dry deadpan humor that makes the game extra fun to play. Without spoiling anything, at the end of the game, there is a song about the AI. Crazed AIs are always so much more fun than normal ones. Portal (game) has the Aperture Computer. Red Dwarf (TV) has a few that aren’t technically deranged… Holly (dim), Talkie Toaster (obsessed with toast), Kryten (inferiority complex). Marathon (series of games) has Durundel. Wargames (movie) has WHOPPR, though it figures out something most generals don’t get: nuclear war is bad. Galaxy Rangers (TV) had an android having a nervous breakdown. Hitchhiker’s Guide to the Galaxy (book, radio) has Eddie the shipboard computer, and Marvin, who is not deranged, but depressed. I am renting an apartment in Rapture, the undersea city in the game Bioshock. It’s a pretty nice modern apartment, very clean and minimal (unlike the apartments in the game). Everything is going well, but then there is a power failure. I am watching TV at the time, and it is on a battery backup, so I don’t immediately notice. But then I look out the window, and the city is all dark. There is rumbling and a crash, and the power comes back on. Everything seems ok, but I gradually notice sprays of water throughout the apartment. One wall cracks, and water then begins to gush in.